ENVIRONMENT Minister Leeanne Enoch is a liability and should not be in charge of any decision-making on the Adani coal mine. Enoch is hopelessly out of her depth. She is a perfect example of why the Labor quota system on factional representation delivers up mediocrity. Her lame excuses for not approving Adani come straight out of Labor Left central casting. When asked to comment on the Federal Government's decision to approve Adani, she told Matt Wordsworth in a live ABC TV news interview last week that progressive governments were getting away from thermal coal. 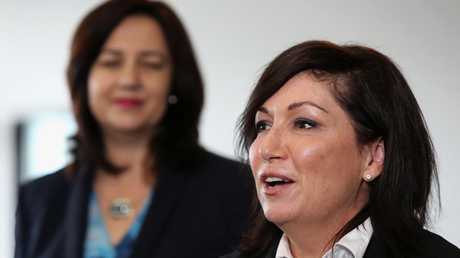 Minister Leeanne Enoch, right, with Premier Annastacia Palaszczuk. Picture: Jono Searle. In other words, she has no intention of approving Adani. Or more precisely, her Left faction leader Jackie Trad has no intention of approving the mine. The threat to the black-throated finch is a ruse. The area set aside for the relocation of the finch is 10 times that of the size of the mine. Fauna experts say the bird is better off under the Adani plan because of the threat of wild dogs, cats and pigs where they currently reside. This is the same government that has delayed the Nathan Dam because of two dozen snails, the equivalent of a couple of entrees in a Parisian restaurant. Let's cut to the chase. The Palaszczuk Government is presiding over a national scandal by stalling the Adani project. 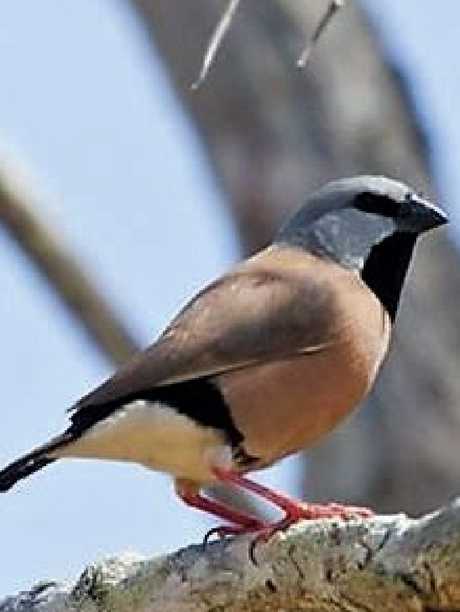 The black throated finch is a serial offender when it comes to holding up major development projects. When the naysayers and luvvies on the Left complain about the Liberal-National Party's preferences relationship with One Nation, it's a smokescreen to divert attention away from the unholy alliance between the Labor Party and the Greens, the most damaging relationship in Australian politics. With their crazy emissions reduction targets, flirtation with electric cars and commitment to phase out coal mines, the Labor-Greens alliance runs the risk of sending Australia broke. The most galling thing about Enoch's behaviour on Adani is her hypocrisy. She is treating voters like mugs. When Enoch stands up to complain about the Commonwealth Government's handling of the Adani project, she complains that the Coalition is "politicising'' the issue. Remarkably, she says it with a straight face. No major project in Queensland has been more politicised by this government than Adani. 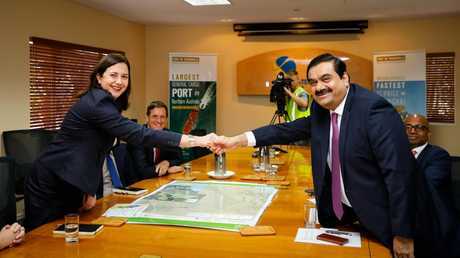 Let's not forget the Premier, Annastacia Palaszczuk, shook hands with billionaire Guatam Adani, welcoming the Indian investment in Queensland, promising jobs, jobs and more jobs for regional Queensland. Now, with her deputy, Trad, breathing down her neck, the premier has folded to the Left-Greens pressure and the obfuscation and excuses being thrown around to stop the mine are mind-blowing. Every time the Labor Government in Queensland finds itself in trouble, it blames the Federal Government. If Bill Shorten becomes prime minister, the Queensland Government will have to start blaming Martians for its woes. 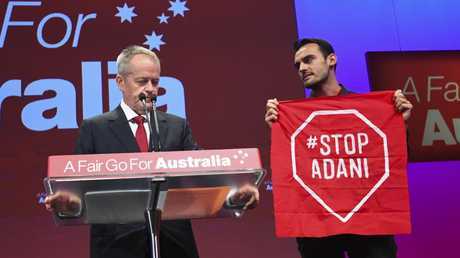 In fact, Deputy Labor Leader Tanya Plibersek has already indicated that Adani will not proceed under a Shorten government. It is clear the delaying of Adani by the ALP in Queensland is about ensuring that it doesn't proceed once Shorten gets the keys to The Lodge. For the past nine years, Adani has jumped through every legislative, legal and environmental hoop required to satisfy regulators. The message Labor is sending to international investors is appalling. Not to mention the frustration in the bush, where unemployment is in the double-digit category, from people who just want to work. It has now emerged that there is a link between vegan protesters and the #Stop Adani movement. They promote each other on their respective websites. No surprise there. Unless the Labor Government approves Adani, it will gift the next election to the conservatives. Adani has become a symbol of the way the Labor Government is being hijacked by extremists, at the expense of prosperity. Queenslanders are waking up to this charade. IN THIS argy-bargy world of Labor union politics, the fight to control the Together Union has become bitter and personal. 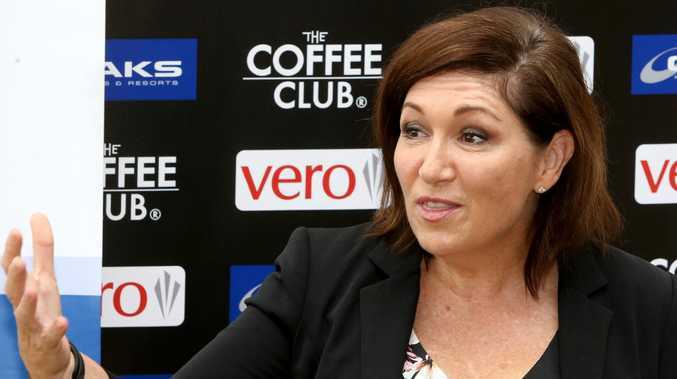 Old scores are being settled as long-time Together Union boss Alex Scott takes on a spirited takeover bid by the Left of the Labor Party. Old heads within the party are worried the Left is becoming way too powerful, having the numbers now in caucus and Cabinet. The behind-the-scenes machinations going on right now for control of the big unions is crucial, considering the unions fund Labor's election campaigns and the Left-dominated United Voice is emboldened. United Voice's Gary "Blocker" Bullock has a direct line to Deputy Premier Jackie Trad and Housing, Public Works and Sport Minister Mick de Brenni. In recent times, the unions have convinced the Labor Government to stack a series of boards with their senior party executives, members or former members. That's why the Left wants control of the 30,000-member Together Union, putting former deputy Irene Monroe, of the Left, up against Scott at the upcoming election. Labor insiders say Scott will "wipe the floor'' with Monroe because his running mate, assistant secretary Kate Flanders, is very popular with members. 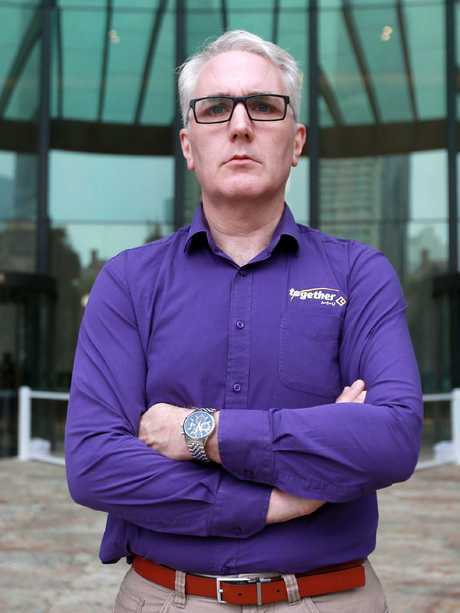 If the Scott-Flanders team wins, don't expect the Together Union to support John Martin for appointment as an industrial relations commissioner. He is married to Irene Monroe. These union heavies play for keeps. BOWEN residents are ecstatic with the Coalition commitment to spend $10 million to kick start the Urannah Dam. This project has been on the books for 30 years. Thank goodness the Coalition wants to build dams to help our farmers. 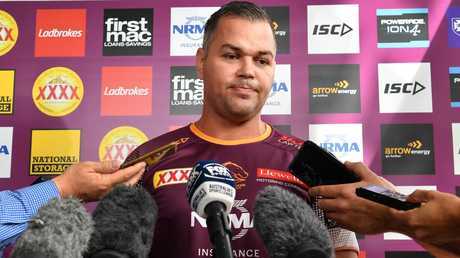 FAR be it for me to be critical of the Broncos old boys, in particular my good mate Gordon Tallis, but the war of words over new coach Anthony Seibold is not smart. The bloke's coached the Broncos for five games. Yes, his record isn't flash but even the great Wayne Bennett had the odd poor start to a season. Seibold has inherited a playing group that are far from settled. Wait until he stamps his own imprimatur on the playing ranks before making hasty and unwarranted criticism. 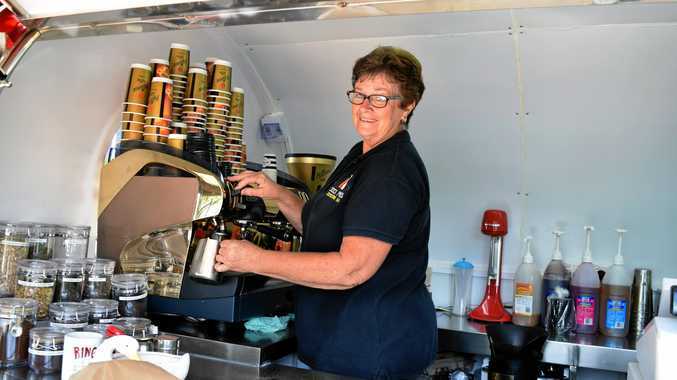 MULLUMBIMBY could be the venue for Australia's next premier greyhound track. It's understood the Border Park Greyhound Club, which stopped racing three years ago after selling its Tweed site, is in talks with the local council. It could be the bestbet for long-suffering greyhound participants in Queensland, who were promised a new track in 2008 but are still waiting. ADVANCE Australia is about to launch a three-part documentary series on what makes advocacy group GetUp! tick. They've infiltrated the Far Left group and the results are pretty revealing. GetUp! even has its own chant. A cult? Advance Australia boss GerardBenedet says "absolutely''. COALITION sources believe new Lord Mayor Adrian Schrinner's decision to axe the Mount Coot-Tha zipline will save four council wards and the Federal seat of Ryan. Rusted on Liberal voters were getting ready to abandon the conservatives over the issue. 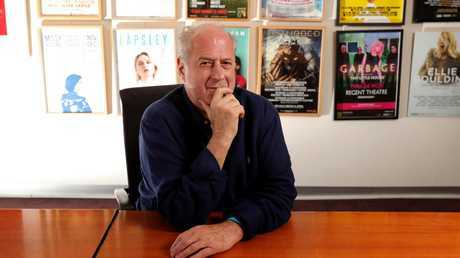 ENTERTAINMENT industry heavyweights Harvey Lister, Rod Pilbeam and Michael Gudinski have teamed up for a joint venture arrangement which will strengthen Australia's ability to attract the biggest names. Gudinski has struck a deal with AEG Presents. Lister and Pilbeam started in the entertainment business 45 years ago, around the same time as Gudinski and his new partner, MichaelChugg. SPECULATION police are making progress in the murder of Queensland horse trainer George Brown and that an arrest is imminent. It follows a $1 million reward being posed. Brown's burnt body was found 30 years ago near Wollongong in the boot of a car.